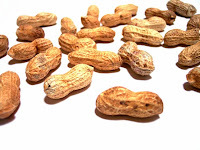 Peanuts account for two-thirds of all snack nuts consumed in the USA. There are four types of peanuts grown in the USA — Runner, Virginia, Spanish and Valencia. Peanuts are planted after the last frost in April or early May. Most USA peanut farms are family-owned and -operated. The peanut growth cycle from planting to harvest is about five months. The peanut plant produces a small yellow flower. Americans eat more than 600 million pounds of peanuts (and 700 million pounds of peanut butter) each year. Peanuts flower above ground and then migrate underground to reach maturity. Two peanut farmers have been elected president of the USA - Thomas Jefferson and Jimmy Carter. A mature peanut plant produces about 40 pods that then grow into peanuts. Besides being high in protein, peanuts are naturally cholesterol-free. They are also an excellent source of folate, meaning they have the ability to reduce the risk of some birth defects in the brain and spinal cord. March is National Peanut Month and November is National Peanut Butter Lovers Month. When snacking, you may think to recall that peanuts or peanut butter are ingredients in four of the top ten candy bars that the United States manufactures. Each year, the average American consumes over six pounds of peanuts and peanut butter products. Each year, Americans consume more than 600 million pounds of peanuts and 700 million pounds of peanut butter!! More than $4 billion of the United States' economy each year comes from peanuts. Talk about setting records! The world's largest reported peanut was four inches long. It was grown in North Carolina by Mr. Earl Adkins. Thomas Jefferson and Jimmy Carter, what do they have in common? They were both peanut farmers who were elected as president of the United States. Peanut butter is the number one use of peanuts in the United States. It takes, on average, 540 peanuts to make one 12-ounce jar of peanut butter. The average child is said to eat 1,500 peanut butter and jelly sandwiches by the time they graduate from school. On one acre of a peanut crop there are enough peanuts to make 30,000 peanut butter sandwiches!! You do the math! Peanuts have traveld a long way and been in many places, South America (Africa), India and China, North America (the United States), and even the moon! Astronaut Allen B. Sheppard took a peanut with him on his trip to the moon. Peanuts have come a long way from their original use of feeding pigs to becoming acounted for as two-thirds of all snack nuts consumed in the United States.